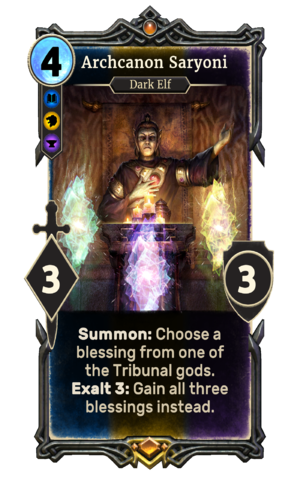 Summon: Choose a blessing from one of the Tribunal gods. 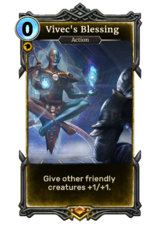 Archcanon Saryoni is a unique legendary Tribunal Temple creature card. It is part of the Houses of Morrowind expansion. Give a friendly creature Drain and Guard. Give all friendly creatures +1/+1. 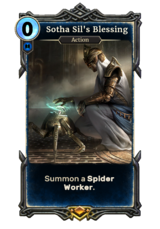 Summon a Spider Worker. "The Tribunal will always come to the people's aid." "By the light of the Three!" 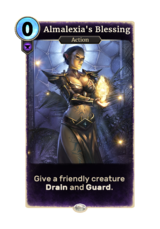 This card's exalt ability applies the Warrior-Poet (when choosing Vivec's Blessing) and the Lady of Mercy (when choosing Almalexia's Blessing) card effect. Archcanon Saryoni first appeared in Morrowind. This page was last modified on 31 March 2019, at 23:31.